Family Dentistry Longmont: Electric vs. Manual: Which Toothbrush Do You Need? Electric vs. Manual: Which Toothbrush Do You Need? Ah, tooth brushing. It’s the thing our parents tried to teach us to do. It’s the habit we hope to have developed by the time we reach adulthood. There are plenty of tools available for keeping your teeth clean, but the main division happens between manual toothbrushes and electric toothbrushes. Electric toothbrushes entered the scene a while ago and many people feel torn about which option to go with. The tried-and-true manual brush? The shiny electronic brush? At Smile Designers, we have had experience with both types of brushes, and we want to share the main pros and cons of each in hopes that you’ll feel confident making whatever choice works best for you. Electric toothbrushes can save you time. Because electric toothbrushes provide between 6,000 and 30,000 brush strokes a minute, they can do a more thorough job. This means that you truly can save some time. However, it’s important to remember that you can’t just run the toothbrush over your teeth and be done. You still need to make sure that every surface of each tooth gets brushed or using an electronic toothbrush won’t be an improvement. Electric toothbrushes can be more fun to use. Compared to a traditional plastic toothbrush, an electric toothbrush can be way more enticing to use. This makes electronic toothbrushes a fantastic option for people who don’t want to brush their teeth, especially kids who still need to build habits. Bells and whistles can go a long way, especially when you would rather play than brush your teeth! Electric toothbrushes can be easier to grip. If you don’t have the grip or dexterity to effectively operate a traditional toothbrush, an electronic toothbrush can be a fantastic solution. It takes care of the circular motion for you and simplifies the task. Manual toothbrushes provide control and comfort. 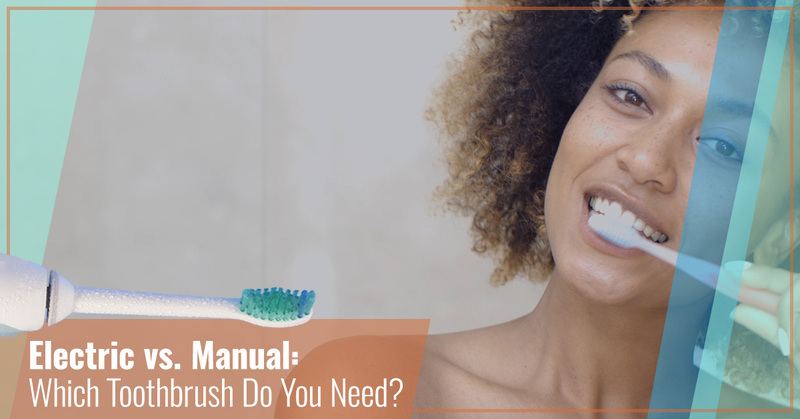 With a manual toothbrush, you get to decide how you brush your teeth — how hard and how fast you brush your tongue, teeth, gums, and cheeks. This means that brushing is a lot more comfortable for people with sensitive teeth. This one is pretty obvious. By not needing to invest in an electrical system, you can save a lot of money. You can get an awesome manual toothbrush for under $10, which means you don’t have to worry when it’s time to replace it. These toothbrushes are small and light, which makes them easy to pack or store in the bathroom. You don’t need to worry about batteries dying or accessories breaking; a manual toothbrush is a so simple, it will always be ready to do the job. Electric toothbrushes can be expensive. Even if you choose a cheap electronic toothbrush, you’ll pay more for it than you would for a traditional brush. If you want a high-quality toothbrush, the price goes up a lot more. Additionally, you still need to replace the head at the same rate you’d replace a manual toothbrush. Depending on the toothbrush you chose, the replacement heads can be pretty expensive. Electric toothbrushes are bulkier than manual toothbrushes. If you’re low on bathroom counter space or you travel a lot, managing a heavy charging base and a big toothbrush can be a pain. An electric toothbrush is about twice the size of a manual toothbrush and can be annoying to fit into small travel bags or cramped bathroom counters. If things are tight, look for a toothbrush with a small base and a manageable brush. The vibrations can be uncomfortable. Electric toothbrushes rotate rapidly, and that creates intense vibrations. For some people, these vibrations are uncomfortable and even painful. It’s difficult to control the vibrations, so if you have sensitive teeth, gum problems, or loose teeth, you should consider a different brushing method that will keep you comfortable. You need good brushing technique in order to make the most of a manual toothbrush. If you don’t take the time to be thorough, you’ll miss spots and end up with troubles. The rotating motion that’s so effective is up to you! Because manual toothbrushes are small, they can be difficult for people without dexterity or good grips. Anyone with arthritis or a similar condition that makes it difficult to use their hands may be better off with an electric toothbrush. Aren’t as fun to use. While you can get a fun, colorful toothbrush for your kids, if you struggle with brushing as an adult, being stuck with a manual toothbrush can make for a lackluster experience. You may be more encouraged to brush if you use an electronic brush. No amount of brushing is enough without regular dental checkups and cleanings. If you have braces, cleanings and checkups are even more important. Visit our family dentistry in Longmont today!